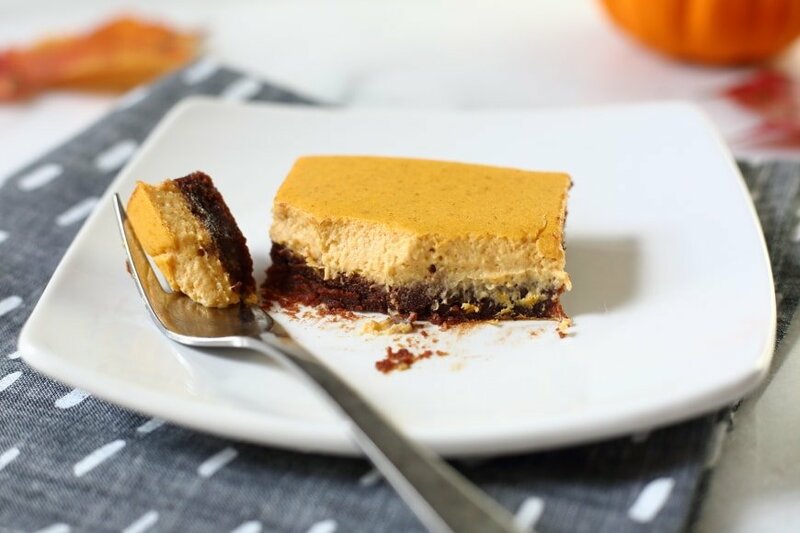 These gluten free pumpkin cheesecake brownies have a rich, fudgy brownie base and a luscious, creamy pumpkin cheesecake topping. 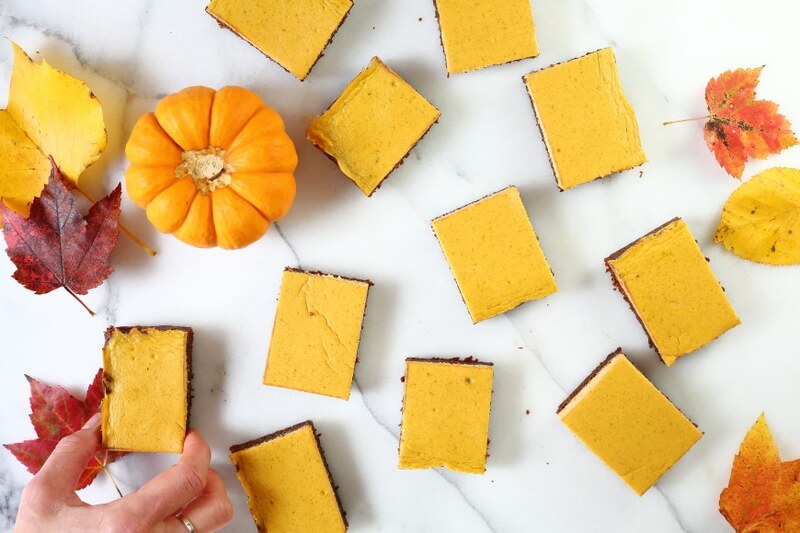 In other words, they’re the perfect fall treat! 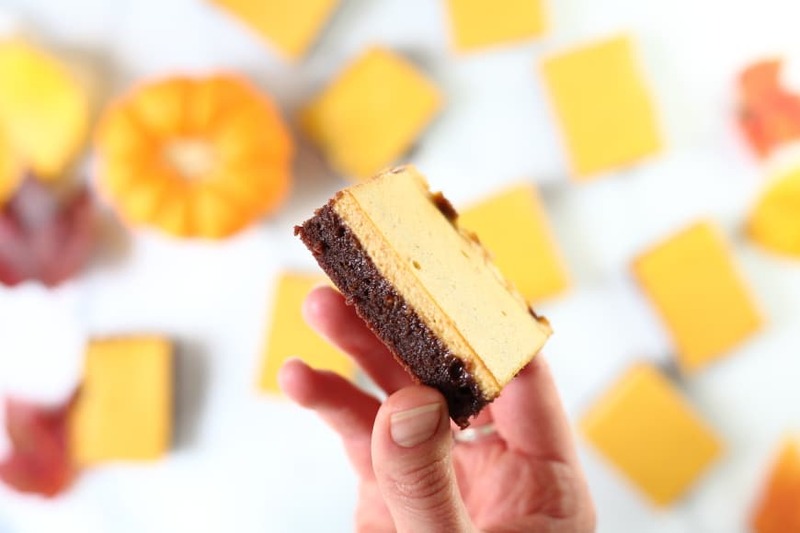 These gluten free pumpkin cheesecake brownies are my favorite new fall tradition (watch the video below!). I’ve never been a big fan of Halloween. While I love any excuse to celebrate anything, a holiday that completely discards dinner has always seemed sacrilege. For a few years after Ella was born, I tried to start a Halloween supper tradition, first with this prep-ahead sweet potato soufflé (which deserves to be made, even if not on Halloween), then with a few attempts at slow cooker meals. But inevitably everybody was either too cranky or too jacked up on sugar (ahem, Ella) when we got home from trick or treating to actually enjoy dinner. So, two years ago I gave up on Halloween dinner. We now take over the local village pub with friends before hitting the streets, which I have to admit, is a ton of fun. But I still can’t quite stomach the thought of tossing out all holiday food traditions (although I’d happily toss out all that candy, if you know what I mean). So. Dessert. 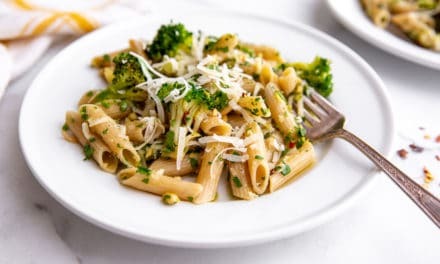 I decided that rather than focus my attention on a dinner that would be disregarded, how about creating a fun dessert that we can savor at the various Halloween parties and festivities that take place in the weekend leading up to the big day? I envisioned something black and orange, but truly delectable, not hokey. 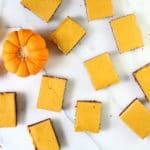 These luscious pumpkin cheesecake bars hit the bull’s-eye. They took several tests to get just right, and now I can honestly say that they’re my very favorite new brownie! 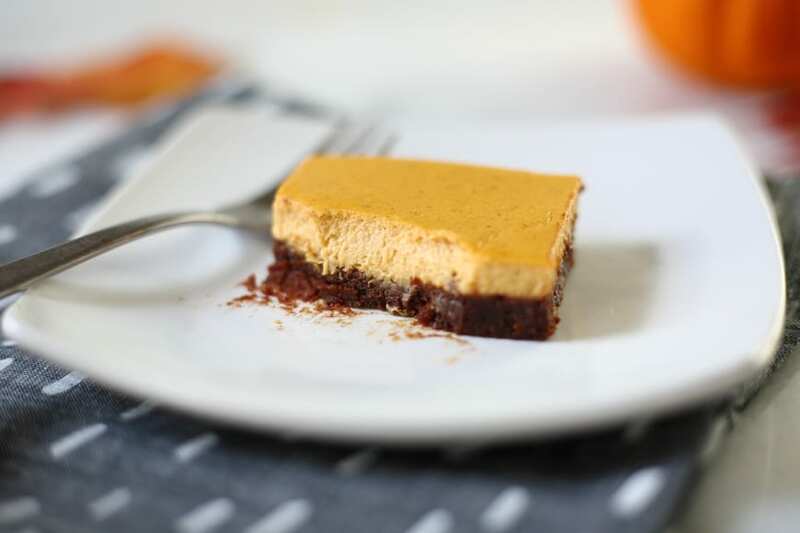 A rich, gluten-free brownie gets capped with a light and creamy pumpkin cheesecake topping. They’re fudgy on the bottom and silky on top and pretty much nirvana in my book. The brownies are elegant enough for a fancy dinner party with friends—they’d make for an awesome addition to a Thanksgiving spread—and crowd-pleasing enough for school parties with kids. 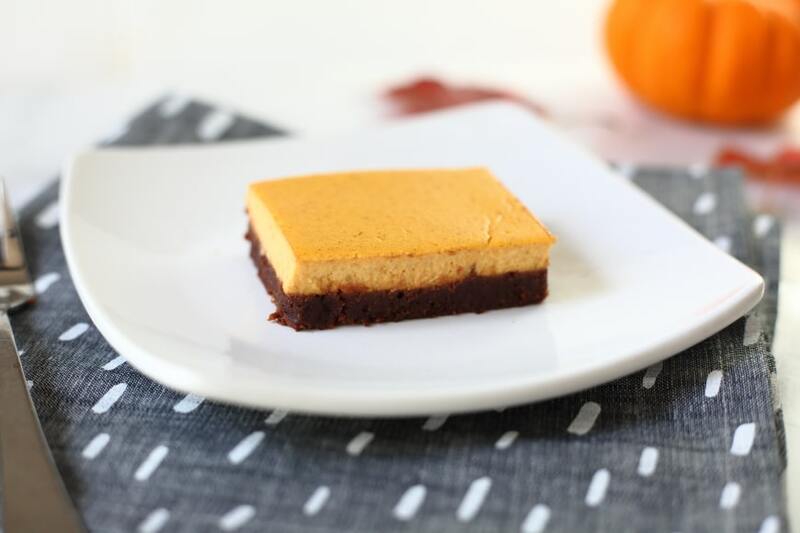 These gluten free pumpkin cheesecake brownies have a rich, fudgy brownie base and a luscious, creamy pumpkin cheesecake topping. They might very well be my favorite new brownie EVER. The brownie base is adapted from Alice Medrich’s Almond and Brown Rice Brownies from her book Flavor Flours (Artisan, 2014), which is my go-to brownie recipe—it’s perfectly rich and chocolaty, and you’ll love it whether or not you eat gluten. Take note that while the batter comes together and bakes in under an hour, the brownies do need about an hour and a half of cooling time once they’re out of the oven. Preheat the oven to 325˚F. Line an 8x8-inch baking pan with foil, with a 1-2-inch overhang (you’ll use this to pull out the brownies later). Spray the foil with cooking spray, or brush with it with oil. For the pumpkin cheesecake batter, in a mini food processor, combine all of the ingredients and blend, stopping and scraping once or twice, until smooth. Set aside. For the brownie batter, place the chocolate and butter in a large heatproof bowl set over a pot of simmering water (the water shouldn’t be touching the bottom of the bowl). Stir often until the butter and chocolate are melted and smooth. Remove the bowl from the heat, and whisk in the sugar, vanilla and salt. Let cool until lukewarm. Whisk in the eggs. 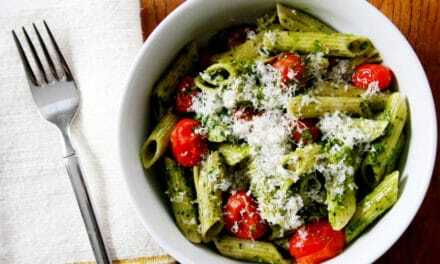 Add the almond flour and brown rice flour, and mix until completely incorporated. Scrape the batter into the prepared pan and spread it in an even layer. Pour the pumpkin mixture over top, and tilt the pan to spread it over top. Using a spatula, gently nudge the pumpkin batter into the corners so that it’s in an even layer. Bake 30 minutes, turning the pan halfway through, or until set—the top should look matte and there should be small cracks around the edges (a toothpick inserted in the center will not come out clean). 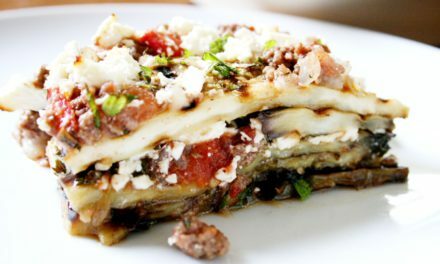 Let cool in the pan on a rack (about 30 minutes), then refrigerate, uncovered, until chilled, about 1 hour. Once the pan is chilled, cover it with plastic wrap then pop it back in the fridge until you’re ready to serve (the brownies can be refrigerated for up to 3 days). Gripping the foil, remove the brownies from the pan. Cut into squares and serve. If the pumpkin layer appears wet on top after chilling, gently blot it with paper towels. The brownies can be refrigerated for up to 3 days. These look amazing!!! I want to bring them to a school party, but, unfortunately, we can’t bring anything containing nuts or nut flour. 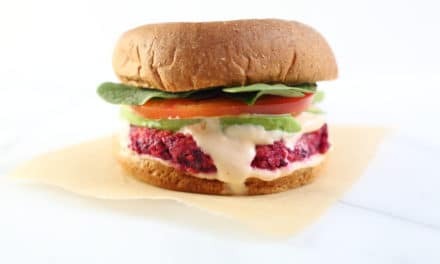 Do you have a recommendation for a substitute for the almond flour that won’t change the flavor too much?